Um… okay, it turns out they’re not chasing down Frank this week. This episode opens with people watching the Superbowl while a mysterious figure waits outside to kill them. One couple leaves, and the other starts to clean up. Meanwhile the killer enters through the completely unlocked back door and talks to himself about not wanting to ‘do this’. I’m actually not clear on whether I’m supposed to think it’s one guy or two. The voice is clearly one guy speaking, and then the same guy speaking in a scary voice, and we only see one set of boots walking into the bedroom to murder the people. In an interesting note, the killer phones 911 to tell them why he’s going to kill those people. Also interesting? Now that I heard the two voices clearly, I recognize that the killer this week is totally played by James Van Der Beek, of TV’s Dawson’s Creek! So that’s what happened to him! Back in Virginia the team is also out at a Superbowl party – this is all character stuff, so largely unimportant, except for the fact that Derek’s in the background, dancing with three women. You know, after episode 12 revealed more about his backstory, I guess I kind of figured that they’d look a little more into the character. Him being molested fits perfectly with what we already knew about Derek – his inability to maintain a relationship, the fact that he’ll chase after anything in a skirt: these are fairly common symptoms of the molested child. But no, he’s just back to being a dawg two weeks later, and his womanizing is once again nothing more than an opportunity for comic relief. Classy. Anyhow, the night of partying is interrupted by a call to help out on the whole Van Der Beek affair. Which is my favorite Ludlum novel, by the way. 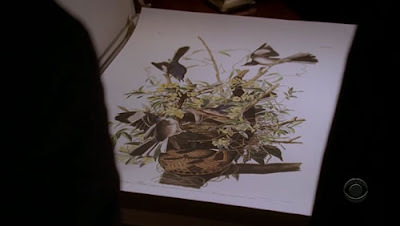 The only person not at the party was Mandy, who, rather than spending all his time tracking down Frank, as he suggested he’d do last time, has instead swung by the Smithsonian to check out pictures of birds. This, for example, is a Mockingbird, a bird that can reproduce the calls of other birds. Gee, I wonder if that’s going to come up in an episode where Van Der Beek is doing hilarious voices? I’m guessing we’ll find out after the opening credits. Back at the office they look over the facts of the case – Van Der Beek thinks he’s the Angel Raphael, and he’s punishing sinners. He even leaves scraps from the bible to that effect at the crime scene! Then we get a flashback to Beek’s abusive childhood, where his father (Patrick Swayze!) 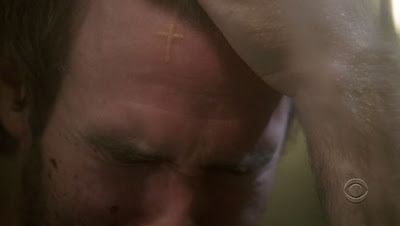 taught him to be a crazy Christian, and branded his forehead with a crucifix! Which, I’d just like to say, is remarkably perfectly formed for a scar he got when he was six years old. I mean, when his head grew isn’t there a chance it would end up misshapen? Are there stats on five-year-olds who get tattoos? So the basic idea is that the constant abuse turned Beek into an MPD sufferer – he thinks he’s himself, the Angel Raphael, and his own father, and the second two always outvote the weak one whenever it’s time to kill. They go over the crime scene and the victims, and realize that the way the victims were killed is exactly the way farmers slaughter cattle. Which jibes with the flashback, in which Beek and Swayze lived on a farm. The local cops can’t find any similarities to other cases, which is strange, because the killers seem to be too good at murder for this to be the first time they’re doing it. Then they get a surprise break – Beek taped the murder using the couple’s laptop camera, and then uploaded it to the internet! Not only that, but he’s still watching the team through the computer! They quickly deduce that the killer must work in technical support, because it’s now a common practice to let someone work on your computer remotely, which is when he’s planting the surveillance programs on the camera-enabled PCs. Then he watches people on their computers, which the public has a surprisingly frequent habit of committing dire sins in front of. For example, one married woman has a laptop aimed right at the front door of her house, so that Beek can see her lover arrive in the middle of the day. Beek’s plan to get the word of god out isn’t going great, though – the internet seems to think that his snuff film is actually a clip from a horror movie. Whoops. The team doesn’t know about the murder yet, but they do discover that someone had tried to break into the first victims’ house a few weeks before the killing. JJ and Reid head out to interview the witness who happened to see the prowler. You know, I just realized that they’ve arrived at the new crime scene, and they’re talking about Raphael without seeing the religious connotation. Mandy’s supposed to be an expert on religion and he can’t come up with the name of an Angel? Oh, and Beek only killed the lover at the scene. He abducted the woman, presumably to kill later, live on the internet. If I’m remembering that episode of Millenium where the online snuff thing happened correctly. While the rest team attempts to track down the killer, Mandy finally figures out the multiple personality thing, and yes, he figures it out by remembering the mockingbirds. They’ve figured out the twist, but it’s not fast enough to save the woman, who’s devoured alive by vicious dogs while the internet watches. A clue comes out of the new video, though – the sheriff recognizes the wild dogs who killed the woman – and it’s the same guy who called the police about the prowler! It seems that he was just testing the response time of the cops so that he could know how much time he’d have to murder the couple! First off, that’s a great burn from Beek. I know he’s the bad guy, but ZING! More importantly, though, isn’t this a pot/kettle situation? Reid’s the complete Mama’s boy who writes his Crazymom a letter every day, right? Beek claims that he didn’t make the 911 call, and Reid and JJ find the whole thing suspicious. Instead of immediately driving away to keep from looking like the know and then calling for backup, Reid walks around the side of the house and goes looking for evidence. Because he’s terrible at his job. Then Beek runs into the barn, and they give chase, once again not calling for backup. They try to explain that they have no cell phone service, and can’t, but that’s complete crap. You’re in the FBI. You drove out here in either an FBI car or a police car. You know what both of those kinds of cars have? Radios. It would be a dark day for law enforcement if they ever had to rely on cell phone signals. Then, adding insult to injury, Reid immediately suggests splitting up. Because there’s no way that can go badly. This man carries a gun. Didn’t he have to take the slightest bit of training in tactical thinking or combat situations? Anyhoo, Beek knocks out Reid and drags him off through a cornfield, and JJ gets attacked by some dogs. Nope. They spent the entire episode profiling the guy, but how was he found out? Simple deductive reasoning, and by checking if someone had been stalking one of the victims beforehand. It was. Although we haven’t actually gotten a solution yet. N/A – I can’t believe I've got to defer judgement two weeks in a row. But I want to give it a zero based entirely on the lack of getting on the radio. I won’t, but I want to. These religious "experts" and their complete lack of knowledge of Jezebel. Not a whore; not promiscuous; not killed by dogs. Despised because of her religion (i.e. not Christianity) and gender (daring to be strong-willed and not deferential enough); defenestrated (by back-stabbing traitors); her corpse devoured by dogs. And was that really Patrick Swayze?! No, it was s brother Don.